Surely, risk is part of a trip to an amusement park. Everyone understands that. But most of us assume that the park has properly trained its ride operators and that the rides are safe. That’s often where we see issues in cases, that amusement park operators haven’t done their part to ensure that everyone working the ride knows how to safely operate it and what the dangers are in failing to do so. 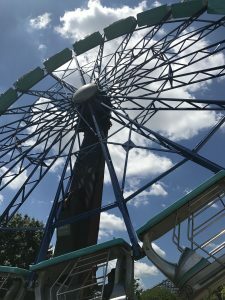 To receive a legal remedy for negligence, the amusement park accident needs to have occurred because of the carelessness of a park worker or employee. In most negligence claims, the plaintiff needs to prove that the law required the defendant to be reasonably careful, that the defendant was not careful, and that this carelessness caused the plaintiff to be injured. providing incorrect or hard to understand instructions to riders. Once a ride is installed in an amusement park, it needs to be inspected, tested and maintained before customers are allowed to ride on it. Even after it is open to the public, this process should continue throughout the busy summer months and during the winter when the park is closed. Rides are also subject to inspections by a state agency. In Kentucky, the Department of Agriculture, Division of Regulation and Inspection, is the organization that conducts this function. In Tennessee, it falls under the Department of Labor and Workforce Development, Amusement Device Unit. Structural or design defects in the ride itself may give rise to defective product liability claims against the manufacturer of the ride or the maker of the defective part. In these claims, plaintiffs must prove that the structure, equipment, or part was defective and that the defect specifically caused injury or death to the victim. Sometimes your amusement park tickets come with a disclaimer on the back. Typically, this is legal language indicating that if you are injured or die while at the park, you absolve the park of all liability (meaning, you can’t sue them). This usually isn’t adequate to protect an amusement park from a legal claim. These defenses are too general and broad, and judges know that most patrons don’t read the disclaimers. In addition, it’s questionable, at best, whether a child or teenager that is legally unable to enter into a contract can be held to what the amusement park is attempting to do (absolve itself of legal liability) via the disclaimer. If you or someone you love has been injured in an accident at an amusement park, please contact our firm, English, Lucas, Priest and Owsley, LLP. We can assist you with your case against the amusement park, insurance carriers and other organizations that should be held accountable for their actions. Contact me, attorney Kurt Maier, at (270) 781-6500 or kmaier@elpolaw.com.